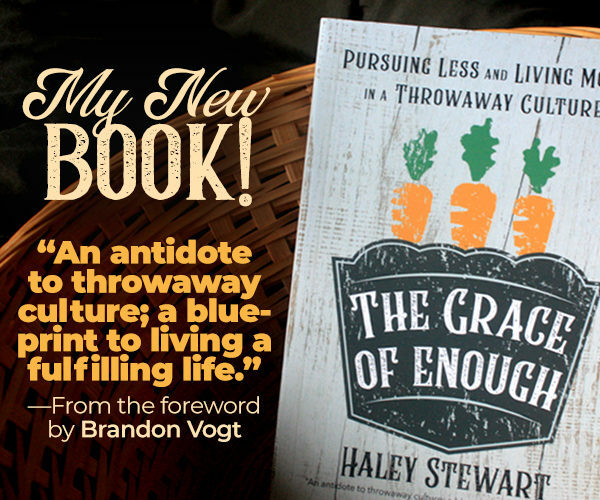 The Grace of Enough: Pursuing Less and Living More in a Throwaway Culture is the story of how my family made the radical decision to leave a secure life in the city, sell our house, get rid of most of our possessions, and move halfway across the country with three small children for a year long internship on a farm with no flushing toilets. We went from being the owners of a lovely little home in Florida to living in a 650 square foot apartment on a farm in Texas. This book is about the lessons we learned along the way. 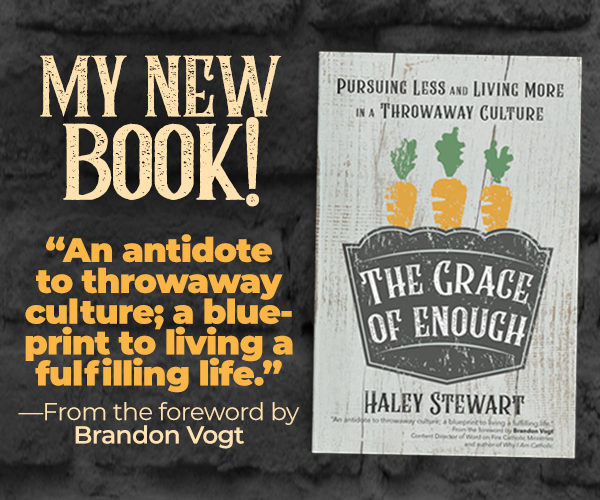 It’s about seeing the unsatisfying “throwaway” culture of consumerism for what it is (comfortable lies that can distract us from what really matters: pursuing the Gospel). The Grace of Enough is about seeing the joy in the call to simplicity and no longer being owned by our possessions. It’s about learning to view God’s creation with wonder so that we can preserve his world as an act of worship for the Creator. It’s about pausing to take a breath and let beauty point us to God. It’s about centering our lives around family, relationships, and prayer in a way that will strengthen our sense of home. It’s about slowing down to do things that remind us that we are human beings like preparing food and sharing it with people we love around the sacred space of our kitchen tables. It’s about opening our homes, despite imperfections in our housekeeping and culinary skills, in our commitment to revolutionary acts of hospitality. It’s about building small but significant habits that nurture community in a world in which we are increasingly disconnected from each other. It’s about living out generous and inconvenient love in a culture that prizes convenience and comfort above all else. It’s about doing what’s best for your family and your soul even when it means going without what everyone else says you must have in order to be happy. It’s about clinging to the hope that we can have a part to play in God’s redemption of this dark world. This is a dark hour for the Church. And I may be foolishly optimistic, but I think in the midst of these horrors, there is a wake up call to become the saints that are needed in the time God has placed us in. And I think He will raise up many saints. 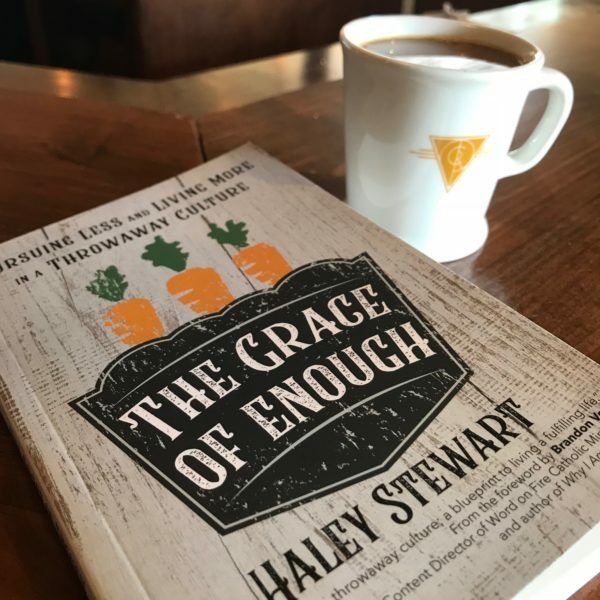 Are you ready to be odd in this throwaway culture because of your radical pursuit of the Gospel? It’s my prayer that The Grace of Enough will inspire you and bring you hope. I truly can’t wait for it to arrive on your doorstep! You can order today on Amazon, Barnes and Noble, or at my publisher Ave Maria Press. And yes! There’s a kindle version!